Earthquakes and foundation scour are the major causes of bridge failure, resulting in substantial direct and indirect losses in Europe and worldwide. Many bridges in earthquake-prone countries have shallow foundations, whose stability and seismic vulnerability can be significantly undermined by flood-induced scour. Despite the relevance of this problem, very few experimental and numerical studies have focused on shallow foundations, with the majority of researches addressing deep foundations. The project aims i) to develop a methodology for non-invasive detection of scour in bridges with shallow foundations based on vibration monitoring, and ii) to quantify the effects of scour on the seismic vulnerability of these soil-foundation-structure (SFS) systems. For this purpose, an extensive experimental and numerical campaign is proposed, by exploiting the facilities available at Euroseistest. The EuroProteas prototype will be tuned to represent a bridge pier resting on a shallow foundation, and various realistic scour conditions will be reproduced by excavating the foundation soil. Ambient, free, and forced-vibration tests will be performed, providing information on how scour can be detected by monitoring the changes in the dynamic response of the SFS system. 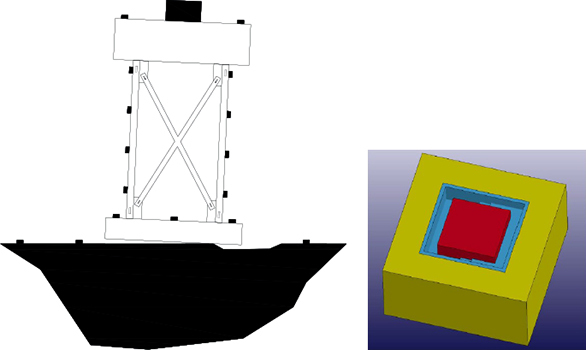 The experimental modal properties obtained for the different scour conditions will then be used to develop, calibrate, and validate analytical and numerical models for simulating scour effects on systems with shallow foundations. The validated numerical models, accounting for SFS interaction and radiation phenomena, among others, will be extended to other scour and soil scenarios, and will be used to predict the ultimate scour depth and the seismic performance of systems with scoured foundations. These results will provide a unique benchmark for informing both the design and assessment of bridges and other marine structures subjected to a sequence of scour and earthquake effects.